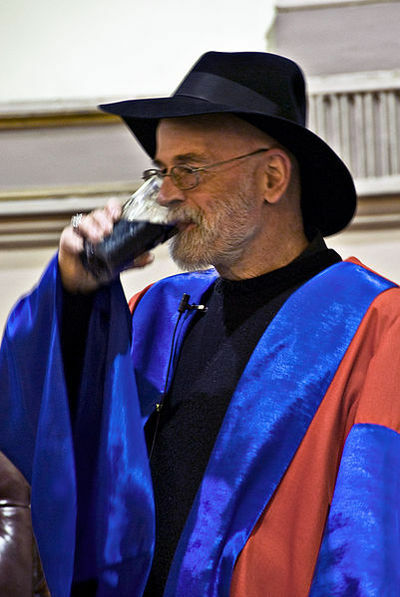 Sir Terry Pratchett is the author of over forty books, most of them novels in the wildly popular Discworld series, set in a world governed by magic which travels through space balanced on the backs of four elephants which are in turn balanced on a giant turtle. Which of his many works do you think is the best? I generally like most of the Discworld novels with Death, and I also remember liking 'The Last Continent' as a kid, but my favourite would be Good Omens that he wrote with Neil Gaiman. I'm a big Gaiman fan as well. I love everything about the book, it's definitely my favourite. I am not a Pratchett maniac, but I loved the Nome trilogy. Three fantastic short books! I've only read the first six or so, but that did include Mort, and I can see why it's one of his most popular ones. I've always personally liked Small Gods, it's a good place to get started on the series without feeling like you're missing all sorts of backstory. I think maybe Guards, Guards!, but I also really liked the Tiffany Aching books. What are you reading in March 2017? What are you reading in March 2015? Which movies do you think could use a gender flipped remake? Have you heard of the 10:23 campaign? Laid - Are You a Fan?